This really is a ‘ski job’ with a difference, and it would be fair to say it might be one of the few of its kind on offer in the industry. We are looking for proficient skiers who would also enjoy other mountain activities, as we offer not only informal guided skiing days to our guests, but also snowshoe and winter walking, as well as cross country skiing, five days a week. As a Ski Guide / Walk Organiser you would spend half of your time out on the hill accompanying guests skiing, snowshoeing, and even a bit of cross country skiing. The other half of your time is spent in the chalet doing a range of tasks from domestic help (room cleans, helping at breakfast and dinner) to manning the bar, airport transfer driving, and lots and lots of guest interaction. There are no corporate sales targets to meet, so you can actually be yourself and engage with the guests on a one to one level, sharing your local knowledge and just helping people to get the best out of the area. We don’t even put you in a uniform! Each evening we meet with our guests for a drink and a chat to discuss the next day’s activities and offer local advice and information. At dinner in the chalets you not only help our Chalet Cooks to serve and wash up between courses, but you sit and eat with the guests as a host, enjoying great food, a glass of wine or two, and the banter and spontaneous enjoyment that comes from such occasions. Although you would get time to ski independently through the week, one of the principle pleasures of this job is enjoying the various winter activities with our guests. If you are looking for a ‘party winter’ then this is not the job for you! The Dolomite villages are very quiet in terms of après ski. If, however, you genuinely enjoy your outdoor activities, if you enjoy building relationships with people and are not afraid of a bit of hard work this has the potential to provide a fantastic experience. 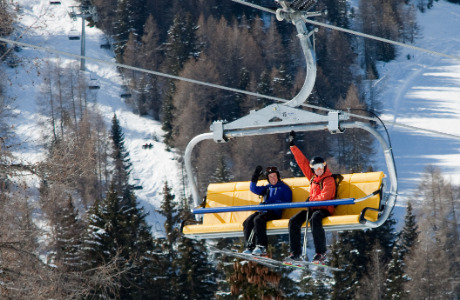 Skiing: You need to be a proficient skier, confident on any grade of groomed slope and happy to accompany groups of mixed ability guests. Walking: Reasonable experience of walking in wilderness or mountainous terrain, confident with map reading and general navigation skills. You need to be relatively fit and happy to accompany groups of guests on any grade of walk whilst enjoying the day yourself. Outdoor qualifications are a bonus but not essential. Driving: Because of the airport transfers we run you would also need to have a driving licence and at least one year's experience of driving, preferably more. You would need to be confident about driving a nine seater minibus on mountain roads in winter conditions too! 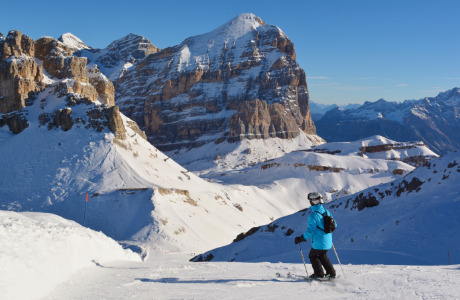 Work a season with Collett's in the beautiful Italian Dolomites. 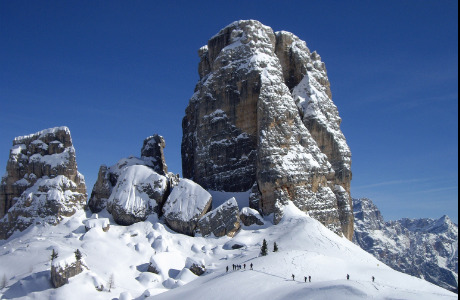 Working in one of the world's most spectacular alpine environments might turn out to be one of the most cherished experiences of your life, but only if you fully understand Work a season with Collett's in the beautiful Italian Dolomites. Working in one of the world's most spectacular alpine environments might turn out to be one of the most cherished experiences of your life, but only if you fully understand what we expect of you on a day to day basis. Collett's is a small, independent holiday specialist, offering half-board, bed & breakfast and self-catering accommodation in three neighbouring villages, each one stunningly set in the spectacular Dolomites of North Italy. People come here to walk at high and medium level altitude, or go even higher on the celebrated Via Ferratas (high level scrambling routes on wires, ladders and bridges). Others come to paint or admire the flora… or just relax in alpine splendour. On the whole our guests are easygoing and united by a passion of the mountains. In the main, they are British, from all walks of life and across a wide age range. They come mainly as couples, but also as groups of friends or families (sometimes with children), walking clubs or individuals. In recent years, we have built up a much valued 'Repeat & Recommended' clientele, which represents more than 50% of the 3000 visitors we welcome to the area each season. Each year we recruit people to join our resort teams on a seasonal basis. Ideally, you will be available from mid-November to the end of April or early May. You must have a love of the outdoors, a genuine interest in (and enthusiasm for) new areas and the ability to contribute positively to a team environment. You must also enjoy people. A polite, sociable and obliging character is essential. Collett's is justly proud of the outstanding quality of its past resort teams and we owe much of our success to their hard work, attention to detail and, most of all, their friendly and engaging characters. If you are the type of person who naturally enjoys the company of other people and enjoys looking after people, whether as a cook or walking companion, then read on. Focus on and interest in the well-being and safety of others. To get the most out of this experience, we cannot over exaggerate the importance of having a keen interest in the alpine environment and mountain activities, especially walking or climbing. There is very little to do in the villages in which we are based unless you are an outdoor enthusiast. If you are looking for a lively nightlife, forget it! We tend to socialise in the chalets or in a local bar with our guests or other members of the staff team. As with most seasonal work within a holiday company, renumeration has a reciprocal nature. The pay represents a typical resort wage, and we endeavour to ensure all members of our resort team get as much from their time in the Dolomites as we get from their hard work. To this extent, we guarantee that, whilst some days are characterised by domestic and/or menial chores, such as kitchen assistance or room cleaning, others will be spent in the great outdoors and will be memorable for their enjoyment and exhilaration. 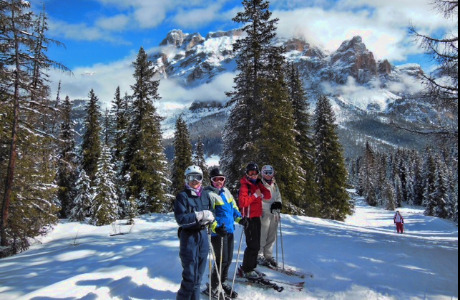 Most, if not all, members of our previous resort teams have cherished their time in the Dolomites. This, we believe, is due as much to the friendly working relationships, which develop within the team each year, as it is to the beauty of the area and the potential for walking and outdoor enthusiasts to enjoy it. As for the package, on top of a weekly resort wage (between €120 and €160 a week), we provide your food, insurance, accommodation (room sharing with one other person is normal), as well as your travel expenses to and from UK. All members of our resort team are sub-contracted and get one day off per week. All of our staff, especially our ski and snowshoe Organisers, must offer accurate and suitable advice to our clients at all times and so, once in resort, everyone is required to nurture a good level of local information and to take an interest in the local geography. The following areas are covered - (With areas such as First Aid, Food Hygiene and Driving etc.. we cannot provide certified training as such, but we do raise your awareness of the relevant safety issues as much as we can). 'Organised days' - procedures and safety. Local Knowledge, the Walks & Neighbouring Valleys.